Bottled water without the bottles! Alpine™ means no more messy refilling chores, no more piles of costly 5-gallon bottles and no more backaches – or headaches – for your hardworking employees. Alpine™ has been manufacturing and providing drinking water filtration systems, bottle water coolers, POU water coolers and in-tank UV sanitation systems and reverse osmosis filtration services around the world. We have the strictest manufacturing and integrity protocols in the industry. Alpine is recognized as the worldwide leader of water filtration equipment and drinking water services. We insure that the water that you drink is the best it can be. Alpine™ not only cuts your rental bill but it also reduces risk of injury to your employees. 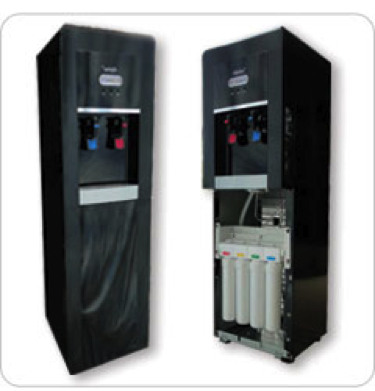 The inventive continuous water connection enables the unit to filter water straight from the source. No lifting, no filling, no problem. 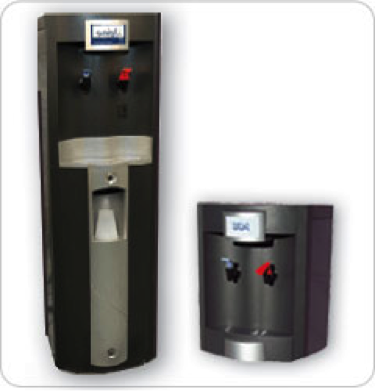 Both the advanced filtering system and the premium reverse osmosis system offer the same convenient features of conventional bottled water dispensers – including dual hot and cold water spigots and child-resistant handles for safety. The standard filter protects against algae and bacteria so common in conventional water bottles. All of which means the self-sufficient unit stays cleaner longer without running dry.